Riverside's selection of carton sealing tapes will fit most requirements. Choose from 1.6 mil tape for light weight packages to our heaviest 3.2 mil tapes for large and heavy weight packages. Box sealing tapes come in a variety of mil thickness and colors. Colored carton sealing tape is idea for identifying special packaging. 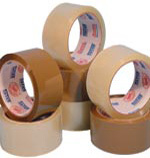 We have Hot Melt packaging tape, Acrylic adhesive tape and rubber based adhesive tapes to choose from.